Green accents — the color of leaves, fresh herbs and new grass — keeps rooms from looking gloomy. We’re on the brink of Winter here in the Northern hemisphere, with our first snows due any day. 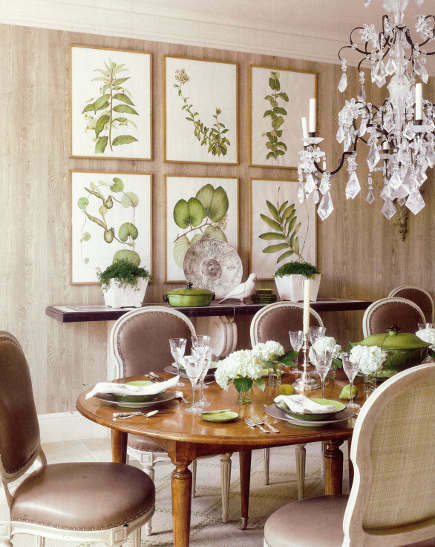 Perhaps that’s why spring green accents used in these rooms feels so appealing. Swedish painted furniture often has a surprise color inside. 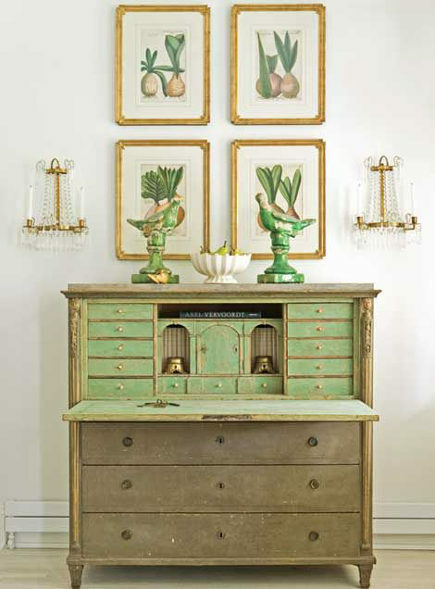 This wonderful greig-y Neoclassical secretary with apple green on the interior drawers and desk top is so unexpected. It was pictured in the home of furniture dealer Loi Thai of Tone on Tone antiques in Washington, D.C. I’ve long been an admirer of his taste. Grouping a set of botanical prints with prominent green elements, and layering green ceramic birds in front of them, makes the green accent so clear. 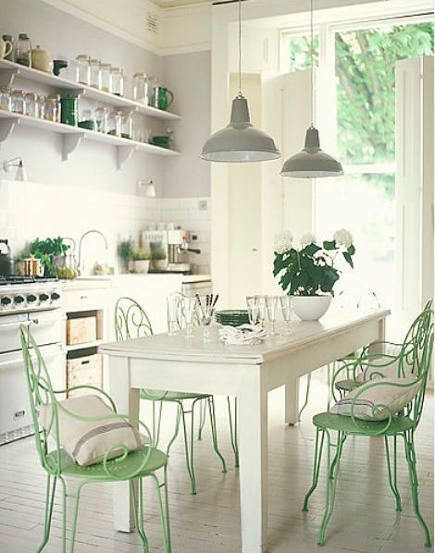 Painting vintage wire garden dining chairs a vibrant mint green is a way of bringing the outdoors into an otherwise all-white kitchen. It’s interesting to see how the smallest green accents — a pot of white hydrangeas, some mint leaves by the stove and a few small just up on the shelves help the chairs look right. Similar chairs still are found in salvage shops and auctions. I’m amazed at how many sets survive and how easy they are to scrape and spray paint. I’ve long admired this dining room even though it’s a bit staid for me — I would so rather see a more modern chandelier to give it a lift. That said, it blends a lot of wood tones and has a forest-y aura with moss in the white jardinieres on the sideboard beneath the set of green botanical prints. Even the green tableware has the same fernlike tones. Green works with this brown because, as I’m always reminded, brown is a form of orange which sits nearly across the color spectrum from green.